Which Bankruptcy is Best for You? Common Bankruptcy Myths: Are You Being Fooled? Can Bankruptcy Save Your Home from Foreclosure? When Can I Refile for Bankruptcy? Enter your location to find a bankruptcy attorney close to you. See local bankruptcy attorneys in your area. Leavengood & Nash offers protection from abusive debt collectors and creditors. If your rights have been violated, call us. Chapter 7 bankruptcy can give you a second chance at a debt free future. Learn more about liquidation bankruptcy today. Most individuals will file for either Chapter 7 or Chapter 13 bankruptcy. Which one is right for you? Wondering if your assets, such as your home or car, are exempt from Chapter 7 or Chapter 13 bankruptcy? Is bankruptcy a bad thing? Let a Long Island bankruptcy attorney inform you on bankruptcy myths and truths. Attorney Bruce Bridgman explains the importance of having a knowledgeable lawyer for your bankruptcy case. Find out if you will be able to purchase a home after bankruptcy. Does bankruptcy affect a debtor’s future credit? The subjects of bankruptcy and debt relief are easily misunderstood. With myths and misconceptions running rampant and due to the fact that every individual's financial situation and goals will vary, determining the right approach to address overwhelming debt can be a difficult undertaking. That is why we recommend connecting with a bankruptcy attorney who can provide you with the insight and guidance you need. This directory was built to offer debtors, both individuals and businesses, with access to helpful information and qualified legal professionals who handle bankruptcy and various other debt-related matters. Take advantage of this opportunity to quickly and easily compare bankruptcy lawyers in your area, or visit our Bankruptcy Information Center to learn more about this important subject. In working with the right attorney, you can rest assured that your legal rights will be protected and you will be given the accurate information that will help you make the right choices about your financial well-being. Find a bankruptcy lawyer near you. The Law Offices of James C. Shields is committed to providing clients with the timely and detailed attention they need to make informed decisions about important financial issues. This firm offers capable representation and legal guidance in a many areas of bankruptcy law, including Chapter 7 and Chapter 13 bankruptcy. They understand that debt can be an overwhelming force in a person's life, and finding the right solution is vital to reaching the chance for a fresh start. It can be difficult to determine the right course of action when the creditor calls are never-ending, but there are options available. This legal team has helped countless clients understand what type of bankruptcy is right for their situation, such as Chapter 7 or Chapter 13 bankruptcy. They can explain the alternatives to bankruptcy, and ensure that their clients' rights are not violated by creditors. Filing for bankruptcy is a complex and emotional process, but this firm's vast experience and detailed understanding of the law allows them to carefully lead each client to the debt solution that best fits their unique situation. If you are struggling with debt that you are unable to repay your creditors, a Torrance bankruptcy lawyer may be able to assist you. This firm provides clients with a comfortable environment in which they can examine the options available to achieve the debt relief they desire. Every case is unique, and each client is given the personal attention and caring counsel needed during such a stressful time. Greatly respected in the community for their skill and high level of ethics, you can trust that this firm will support and advocate for you at every step of your proceedings. 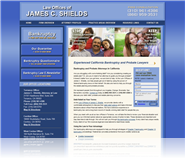 To learn more about the professional services available to you, contact a Torrance bankruptcy attorney from the Law Offices of James C. Shields. Divorce harassment laws, What can I do ? can creditors go to an acquaintance's home saying they're going to serve with papers? answered by Van Horn Law Group, P.A. About how much in total does it cost to file for bankruptcy? Dating While Divorcing: How Soon Is Too Soon? Is My Bankruptcy Made Public Information? How Does Bankruptcy Affect My Credit?